This web site gives our company value, far beyond its brick and mortar business. 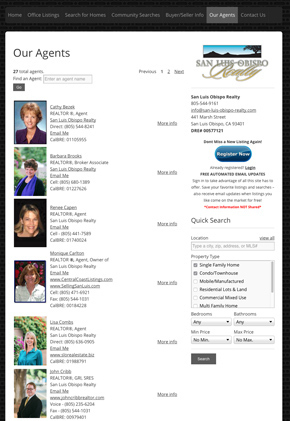 It is the top broker and San Luis Obispo real estate “storefront" on the internet! Q: What are your company goals in regards to your iHOUSEweb product? A: To present an online representation of our company in an eloquent and professional way, that stands out above all other real estate web sites in our area. To provide visitors with search tools to find and save properties that meet their criteria with automated email notifications of new similar listings. Q: How has iHOUSEweb helped you in accomplishing your goals? A: Overall, iHOUSEweb has given us the foundation and support to make our web site one of the top performing real estate web sites in our county. Q: What results have your company and agents achieved? 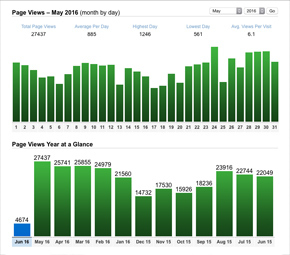 Our web site averages 30,000 Page Views per month with roughly 885 visits a day! Q: What advice would you give to REALTORS™ about their Real Estate website. What should they keep in mind? If you are transferring an old domain name and web site to a new hosting provider, make sure that “301 redirects” are in place for each page. iHOUSEweb did a good job of doing this so we did not lose previous Google ranking. To be sure, no web site will be great unless there is unique content and someone behind it that will do the extra work it takes to be good. iHOUSEweb gives you that foundation and great on-going support.